In a big continent with lots of countries, going through other nations is fast and easy. It is just a journey to the border. I experienced that when I had my trip to Southeast Asia. I was in Saigon, Viet Nam and I planned to cross border going to Cambodia. I did a lot of research in different blogs and web and it was really helpful. I found out that there are bus companies that drive directly to Cambodia if you are from Saigon/ Ho Chi Minh City. But, it wasn’t confirmed yet since it was only online until I got to the hotel and let them arrange a transportation for me. I was staying in N.Y. Kim Phuong Hotel at Hai Ba Truong Street, check out my blogpost by clicking here. 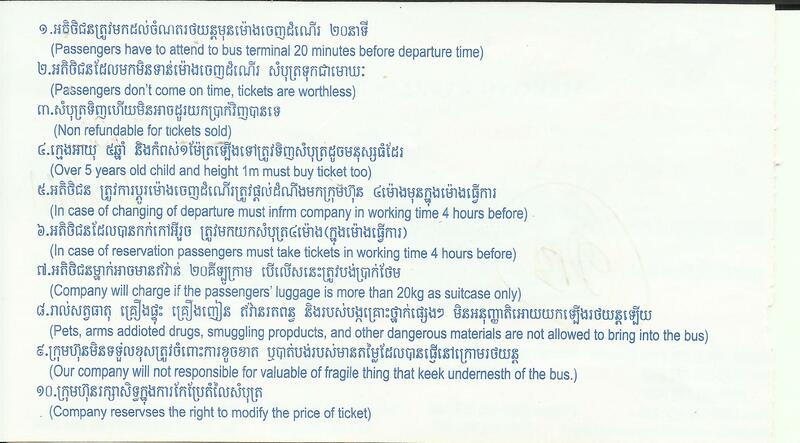 I have different choices of bus companies such as Sapaco Tourist, MaiLinh, Mekong Express, and etc. 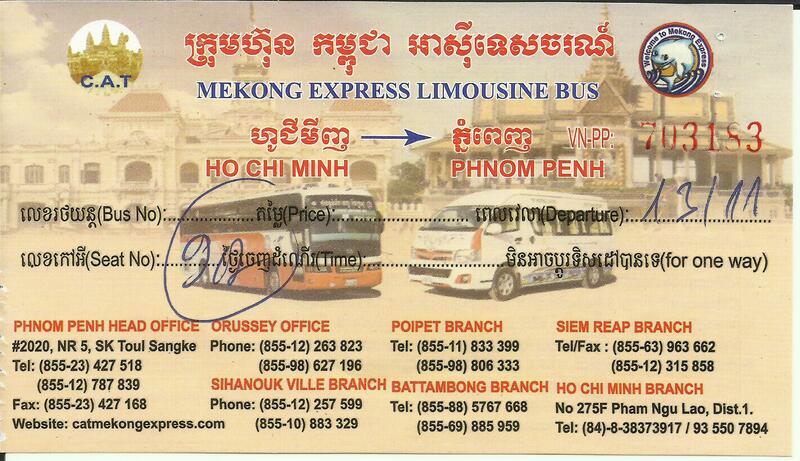 I chose Mekong Express Limousine Bus since I read good feedback about it. I made sure that I have arranged it ahead of time like a day before my scheduled trip. They have different time trips. Anyway, I paid the ticket for USD15. The bus station is just located at 275F Pham Ngu Lao Street, District 1. For a trip from HCMC, Viet Nam to Phnom Penh, Cambodia, it will take about 6-8 hours but it depends on the border and immigration process. So, I started the day early since I have booked an 0830H bus going to Phnom Penh, Cambodia. I had a taxi drove me from my hotel to the bus station and paid only 50,000VND. When I arrived there, the bus still hasn’t arrived so, I have to wait in their office. But 10 minutes before the schedule departure time, the bus arrived and with the assistance of the staff, they took our bags and placed it on the compartment area in the bus and we also showed our tickets since they needed to put the seat number on the bags so when we will claim it, there will be no loss or picking up the wrong luggage issue. At exactly 0830H, we went our way to our destination. Snacks were served while en route. The bus is spacious with toilet at the back. It took about 3-4 hours to get to Moc Bai, Tay Ninh Province which is the border of Viet Nam. We went inside the immigration office and have our passports taken by the bus staff. Staff will bring the passport for exit stamping in Viet Nam. We waited there for about an hour since there were a lot of travelers crossing borders and also waited for our names to be called. Once they called you, you just get your passport and go back to your bus since it will be another ride going to Cambodia border. You will see these views in the border. For just 5 mins, you will get to see the Cambodian immigration building and directly proceed to the immigration officer to have your passport stamped for entry. The officer usually asked for how many days you will be staying in their country. It was fast and easy. I had mine stamped in just a minute. Then, I crossed the border with ease and stepped my first foot on the land of Cambodia. I was in Bavet, Svay Rieng in Cambodia and traveled about 3-4 hours again to get to Phnom Penh. We even passed through the Mekong river via ferry. I arrived in Phnom Penh, Cambodia at 1630H. I headed directly to the hotel to take a long rest. The whole experience was amazing and it was my first time to cross borders and hopefully, it won’t be the last.